Dynamic Warm Up Exercises Before Running | So What? I run. I’ve gotten into the habit of not properly warming up before a race. Don’t get me wrong, I do warm up, but with the excitement of the race and the hassle of the crowd, I’m sure I don’t do enough. 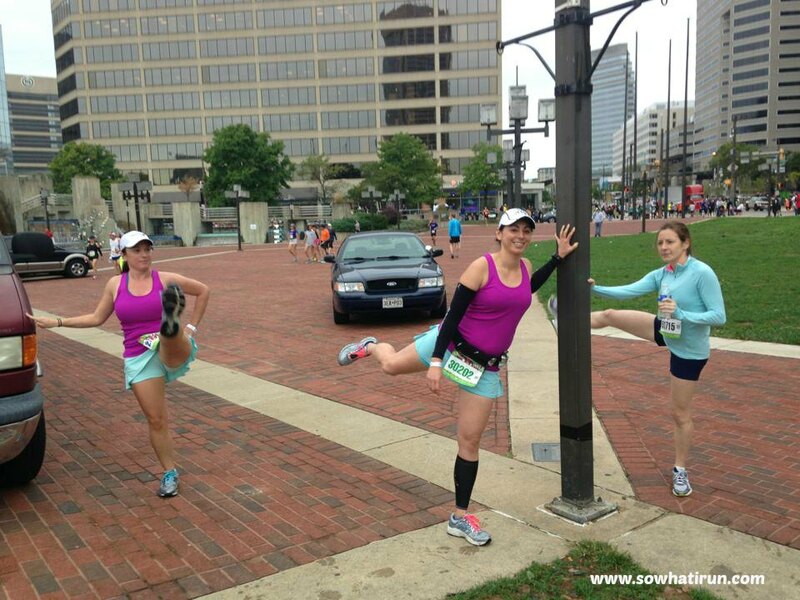 I have to thank my friend for capturing this picture in action at yesterday’s Baltimore Running Festival. Couldn’t have planned it any better. Warms up the core muscles and promotes hip mobility and Achilles tendon flexibility. To Do: Lift your arms above your head. Step your left foot forward into a lunge, making sure your knee doesn’t extend forward past your foot. Step back to start, bringing arms down. Switch legs. Do eight to 10 reps on each leg. Warms up the glutes, hamstrings, and quads. To Do: Without bending your knee, step forward and kick your right leg out and up to waist level. Extend your left arm at the same time, as if to touch your foot. Release and switch sides. Do 10 reps on each leg. Activates the glutes and adductor muscles. To Do: Stand with your feet parallel, hip-width apart. Step to the right, then shift your weight toward the right foot, bending your right knee and pushing your hips back. Your left leg should be as straight as possible. Reach for your right foot with your left hand. Push off with your right foot to return to starting position. Do 10 reps on each leg. Improves hamstring and glute flexibility. To Do: Stand with your feet wide, toes pointing forward. Keeping your legs straight, reach your left hand across your body and try to touch your right toe. Return to center. Repeat on the other side. Do eight to 10 on each side. Activates the core muscles and boosts flexibility in the glutes and hamstrings. To Do: Balance on your right foot and hinge forward, allowing your left leg to extend back. Touch the ground with your left hand. Return to standing. Do 10 to 12 reps, then repeat on your left leg. This entry was posted in Marathon Training and tagged Dynamic stretching, Marathon Training, Physical exercise, Runners World, Running, Warming up by SoWhatIRun. Bookmark the permalink. I’m all about lunges prelong run! I’m going to start doing them. Don’t know why I didn’t before….eeesh!